Sports and innovation has been a subject of great interest to the Lemelson Center that we highlight as part of our 2016-2020 strategic planning efforts. Today, the general public has access to increasingly sophisticated equipment and specialized clothing, which eventually come to the mass market as a sort of hand-me-down from professional sports. Constant micro improvements in materials science and design, sports medicine, and kinesiology lead to macro changes for expert and eventually amateur athletes alike. Tennis racket used by Althea Gibson, in the collections of the National Museum of American History. I feel almost overwhelmed now when I shop for, say, tennis equipment, shoes, and clothes. As a kid, I didn’t think twice about playing with a small aluminum racquet borrowed from my dad while wearing old sneakers, terry cloth (!) shorts, and a cotton t-shirt, but today I can get fitted by a professional for both the right-sized titanium-graphite racquet and the best shoes to support my flat, under-pronating feet, as well as purchase moisture-wicking tennis outfits. Over the past 20+ years at the the Lemelson Center, we have examined invention and innovation in a variety of sports through exhibits, public programs, blog posts, podcasts, and archival and object collecting opportunities. 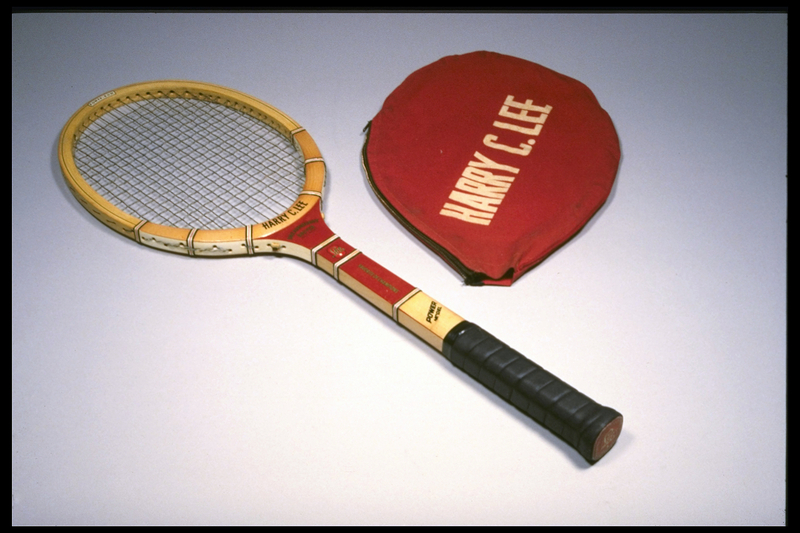 Early efforts included a small “Sporting Invention” showcase exhibit highlighting skis and tennis racquets invented by Howard Head, whose papers are part of NMAH’s collections. That same year, 1999, we also hosted a behind-the-scenes tour of Oriole Park at Camden Yards in Baltimore (the Washington Nationals weren’t here yet!) to learn about high-tech innovations behind the modern baseball park. 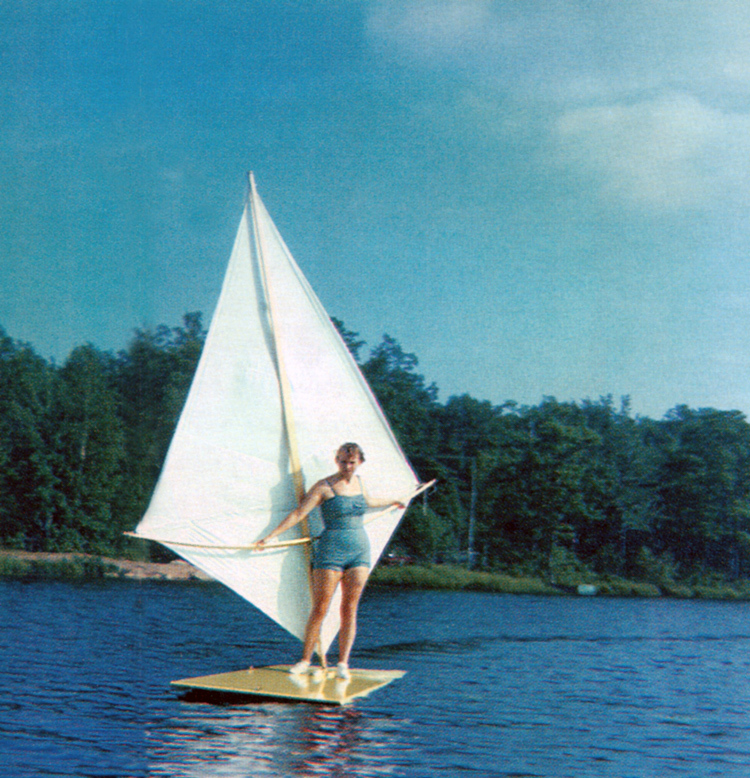 In the Center’s former Invention at Play traveling exhibition, which closed in 2011, visitors enjoyed reading about Newman Darby who invented the sailboard (better known as windsurfer), seeing his first homemade board and sail, watching a video of his first test of it in 1964, and then trying to learn how to windsurf on a Sailboard Simulator based on his own design. They also saw sports equipment such as a hockey mask, fishing rod, tennis raquet, and a canoe and oars made out of Kevlar, a strong yet lightweight fiber invented by Stephanie Kwolek at DuPont. 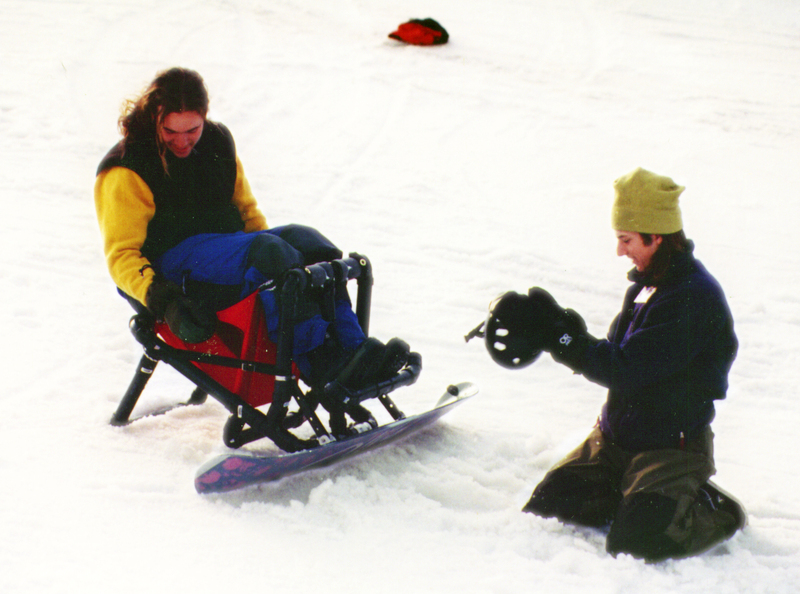 One particular focus of interest for the Lemelson Center has been assistive technology, including sports-related inventions. In exhibits and Innovative Lives programs we have featured a variety of accessible inventions, from an accessible snowboard developed by college inventors Matt Capozzi and Nathan Connolly and a Waterbike for therapy invented by teenager Krysta Morlan who has cerebral palsy, to a handcycle created by avid bicyclist and machinist Mike Augspurger and a “cheetah leg” for amputee runners designed by Van Phillips, inventor of the Flex-Foot line of prosthetics. These inventions invite wider participation in sports and help expand the definition of who can be an athlete. Events like the recent Invictus Games dramatically underscore the power of making sports accessible to all. Lemelson Center team members have written numerous sports-related blog posts reflecting our own personal interests, ranging from stories about football helmets, running shoes, and baseball equipment to bowling pin machines, NASCAR safety barriers, and science and engineering behind the Olympic Winter Games. For August I look forward to writing a similar blog post about the Olympic Summer Games being held in Brazil this year. During a layover at the Charlotte, NC, airport last December, I met the men's head coach for the US Rowing team, Bryan Volpenhein, who was then on his way to a training session in Florida. It was fascinating to talk with him about how incremental advances in materials science and design for boats and oars can make big impacts on racing times. The Lemelson Center’s biggest foray into sports thus far has been the multi-faceted, multi-year Innoskate project exploring invention and innovation in skateboarding and skate culture. 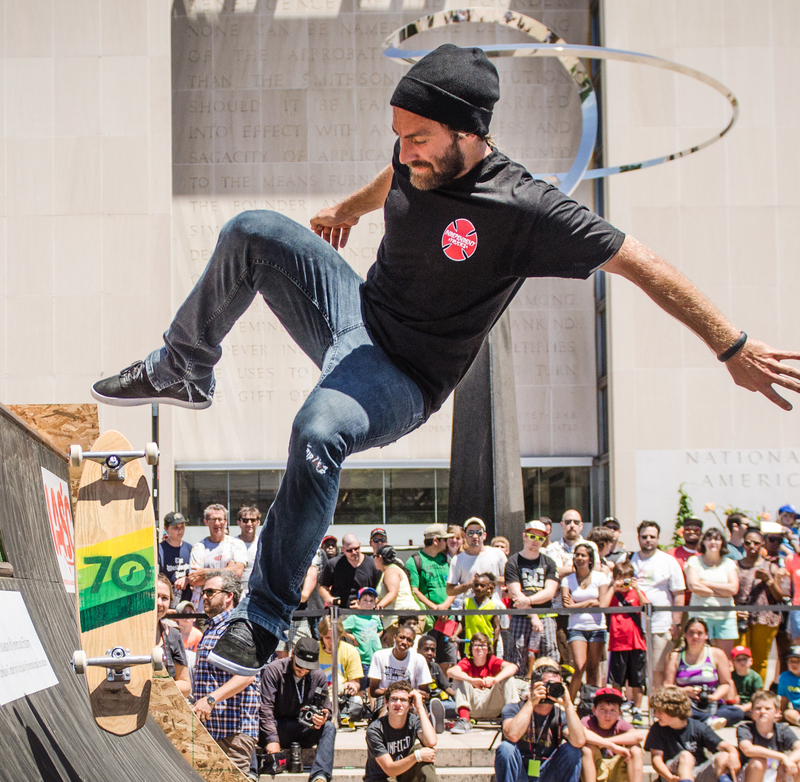 It began with an extremely popular 2013 public program at the National Museum of American History, where we set up a skate ramp on the Museum’s Mall-side terrace and featured demonstrations and talks with skateboarders and inventors, including Tony Hawk and Rodney Mullen, Robin Logan, and Cindy Whitehead, among many other pioneers. We even collected Tony’s first skateboard after he rode it one final time! This innovative look at an unexpected sport led to widespread interest, inspiring Innoskate festivals in 2014 with the Polk Museum in Lakeland, FL, and the Museum of History and Industry in Seattle. In 2015, Innoskate went to the X Games in Austin, TX, expanding our skateboarding networks, reaching broader audiences, and even enhancing our street cred. We are pursuing some potential future Innoskate collaborations, and also are considering other sports and innovation related public programs and possibly even an exhibition on the topic. Keep an eye out for news on our website, and let us know if there are particular sports-related invention stories you'd love to hear! You tune into the Olympics to watch feats of athleticism, strength, grace, and endurance. But don't forget about the feats of technology!